Annie Jump Cannon was a female astronomer best known for coming up with the current system of stellar classification. Her system — ranking stars as O, B, A, F, G, K or M, with "O" being the hottest stars and "M" the coolest (the sun is a "G" star) — is still used today. She also created a saying — "Oh! Be A Fine Girl – Kiss Me!" — to help astronomers remember the letter sequence. Cannon was born in December 1863 and studied physics and astronomy at Wellesley College before graduating in 1884. After pursuing other things for a few years – such as photography – she did more advanced studies in astronomy at Wellesley and the Harvard-affiliated female institution, Radcliffe College, according to Britannica. Cannon joined the group then called "Pickering's Harem" (which would be considered a derogatory term today) in 1896, where she and others worked on better classifying star spectra on photographic plates. A member of the group, Williamina Fleming, came up with a classification system ranging from letters A to Q based on how strong their hydrogen spectral lines were, Britannica added. This work was refined by another Harvard computer, Antonia Maury. "Cannon simplified two earlier schemes into one that astronomers still use today. Her classification had just seven letters arranged by decreasing temperature: OBAFGKM," wrote Air and Space Smithsonian of her work. "Over the course of her life, Cannon classified the spectra of over 350,000 stars — legend has it that she could look at any stellar spectra and classify it in just three seconds." Her work was published in nine volumes of the Henry Draper Catalogue between 1918-1924, according to Harvard. She also made the Harvard Catalogue of Variable Stars. By 1911, Pickering wanted Cannon to be the curator of astronomical photographs, but the Harvard president of the time refused to add her to the staff list, Harvard added. Cannon's appointment was finally made official in 1938. She won multiple awards, including the Henry Draper Medal of the National Academy of Sciences. Cannon retired in 1940 and continued doing research until she died the following year. While Cannon was one of the more famous female computers at Harvard, critics note that Pickering received much more credit than they did. Pickering was highly decorated in his lifetime, Smithsonian Magazine pointed out, and there are craters named after him on the moon and Mars. Meanwhile, the magazine added, "Annie Jump Cannon's enduring achievement was dubbed the Harvard – not the Cannon – system of spectral classification." Cannon's spectral classification system is still used today – with a variant. The modern Morgan-Keenan spectral classification system still uses the OBAFGKM sequence, but subdivides each star into a luminosity class to more precisely define its type. 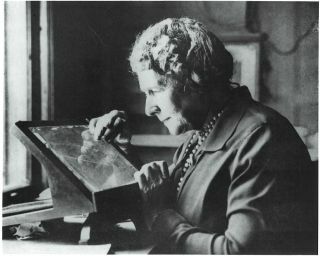 One part of Cannon's legacy is an "Annie Jump Cannon Award in Astronomy" given by the American Astronomical Society every year to a woman who received her Ph.D. no more than five years ago. Cannon herself established the fund out of prize money she won in her lifetime. The first recipient in 1934 became the first full professor of astronomy at Harvard: Cecilia Payne-Gaposchkin.